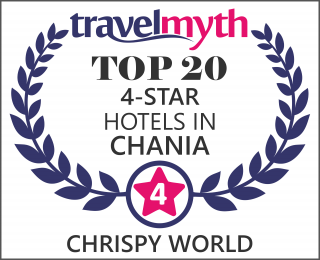 Chrispy World hotels, are located in the village Rapaniana, municipality of Kolimvari, 20 km west of the City of Chania. In a unique natural environment and only 100 meters away from the sea, the hotels welcome you to your most ideal vacation resort. The location offers to every guest the best occasion to get to know the beauties of the island. The picturesque villages succeed each other, whereas the mountains, the sea, the canyons and the rivers build a wonderful puzzle of alternating images during every route. It is worth visiting important sights, such as the Orthodox Academy of Crete, the Gonia monastery, St. Ioannis (John) monastery as well as the most famous beaches of the island, namely Falasarna, Balos and Elafonisi, more to the south. The city of Chania is only 25 minutes away and Platanias, with its diverse nightlife and many amusement offers, is very close. There is a regular transportation service (every 30 minutes) and the bus station is right outside the hotel. Pay now for your reservation and get up to 15% discount on the total price! Stay at Chrispy and drive! Book now our package for 3 or more days and rent a car in an exceptional price!